Copyright © 2010 by the Editors of Working on the Moon. Last revised 9 January 2010. Caution driving down-Sun. LM map location uncertain till they get to Plum. Brief, unplanned stop at Halfway Crater because of nav. undertainty. Followed outbound tracks so less caution despite poor up-Sun visibility. John mentions in the mission report that he did some tacking to improve visibility. On the return to the LM, they stopped near the ALSEP so that Charlie could film John doing the Grand Prix, which involved John driving the LRV toward the LM and back. John drove for about 25 seconds toward the LM, reporting a max speed of 10 km/hr along the way. He then turned and drove back in about 25 seconds. The distance driven was no more than 140 meters. He then did a second run. In total, each of the runs took about 1 min 05 seconds. *The odometer value used at the ALSEP when they get back is the value given later at the LM minus 0.4 km, total, for the two Grand Prix runs and the 0.1 km return to the LM. 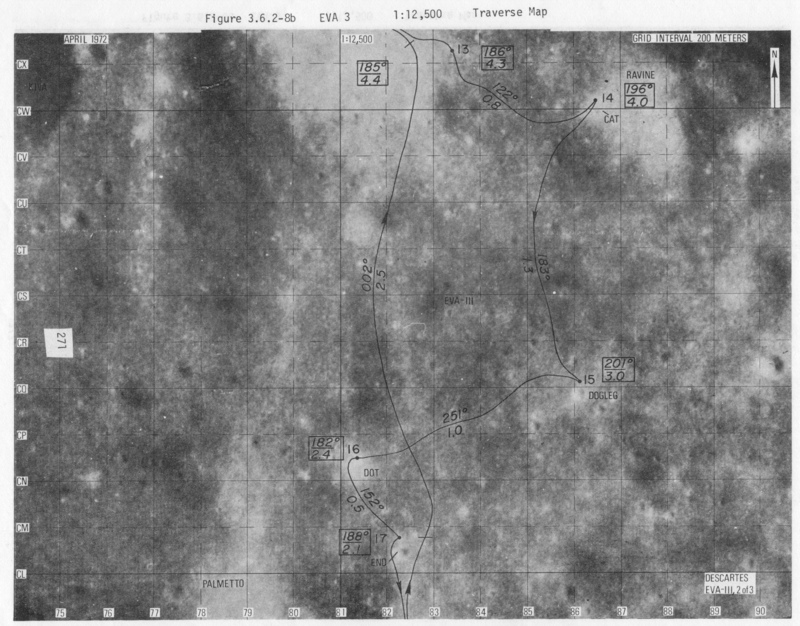 Figure 6-6 from the Apollo 16 Preliminary Science Report shows the various station locations and approximate locations from which Charlie took various traverse photos. 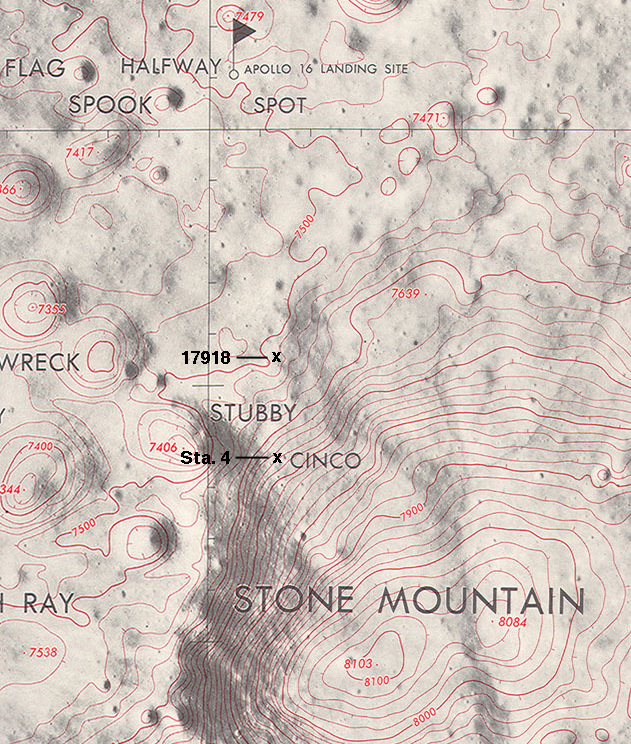 John and Charlie drove SSE from the LM, climbed up onto Survey Ridge and drove SSW along it before heading to a point at the base of Stone Mountain directly north of Station 4. The started climbing at about the indicated place whereCharlie took photo 17918. Their average speed along their actual path is necessarily greater than the 7.5 km/hr range rate. 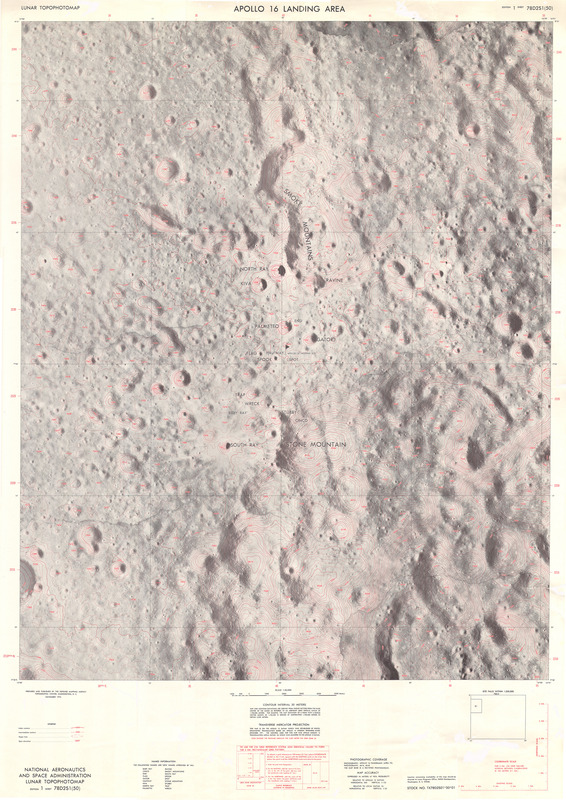 Station 4 and the approximate spot where Charlie took 17918 are shown in a labeled detail from topographic map LTO78D2S1(50) (5.7 Mb) indicates that they were driving cross-slope and climbed about 145 meters in 1.1 km. The slope they experience is about 7.5 degrees. Followed their outbound tracks partway downhill. Young: Ya-ho-ho-ho-ho. (Pause) Look at this baby (meaning the Rover). I'm really getting confidence in it now. It's really humming like a kitten. Duke: Oh, this machine is super. CapCom Tony England: Probably a good idea you couldn't see how steep it was going up. Young: Darn right it was. (Pause) Okay. I've got the power off, and we're making 10 kilometers an hour. Just falling down our own tracks. (Pause) Uh-oh. John is probably saying that, if Houston had real-time TV of this drive, the NASA managers would be having heart-failure and would make the crew stop and walk down the mountain. At 146:03:32, they turn left and drive west along a bench to find a suitable crater for sampling. *The nav system is not working properly, probably because of the various changes in switch and circuit breaker setting made while diagnosing the drive power problem. *They notice the nav system errors during this segment. They do the Station 10 activities near the ALSEP. 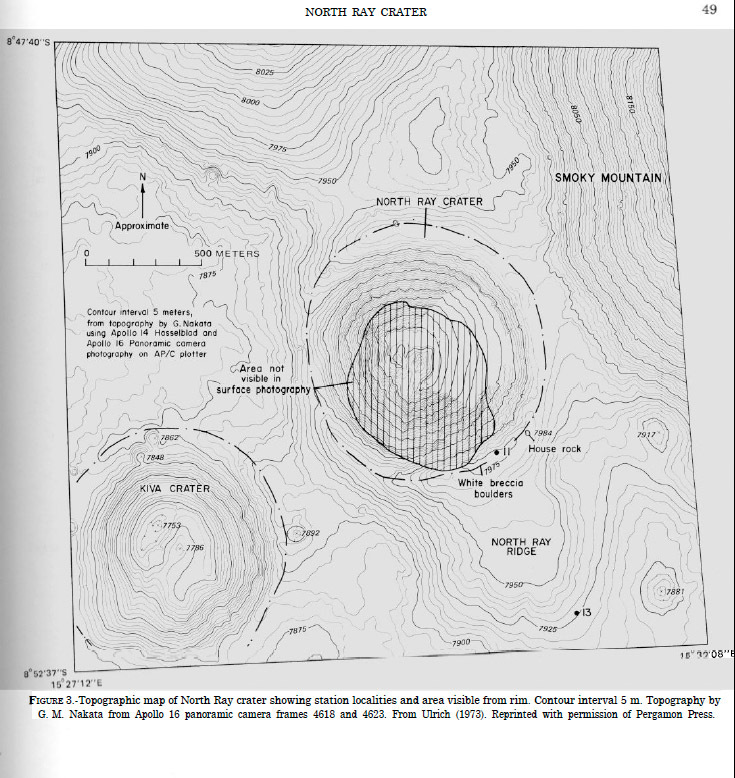 They climb a ridge immediately north of the LM, then back down into a "big, sag-type area", and continue north to the elevated rim of Palmetto Crater and along the rim toward End Crater. England: Y'all are making some outstanding time there. Duke: It's really easy going, Tony. (Hears Tony) Well, he's got it full blower at 11 clicks, and we're just going over an undulating terrain. *Map location directly from LRV nav. readout of range and bearing to the LM. Their map location at the end of this segment is CV.5/82.5. At the start of this interval, they are just east of Station 13. 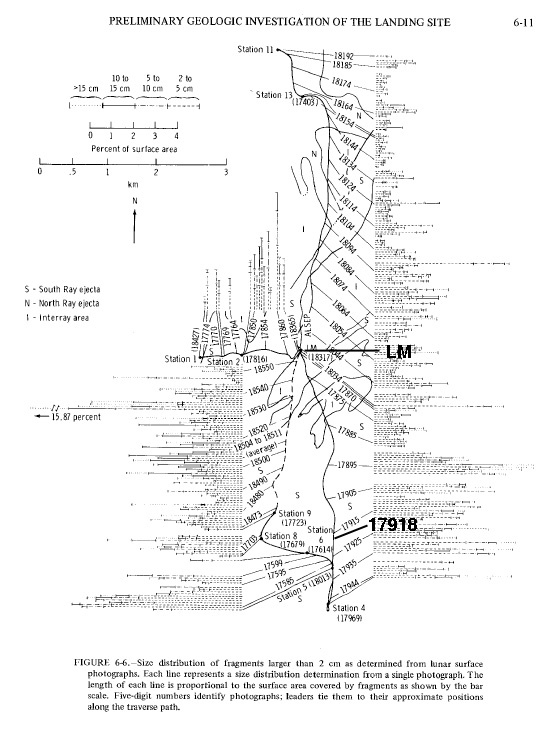 As can be seen in the contour map from the North Ray chapter of the A16 Professional Paper, they climb about 25 meters over the next 200 meters, a slope of about 7 degrees. climb about 10 meters, on a slope of 1.3 degrees, and then finish with a climb of about 15 meters over the final 150 meter to Station 11, a slope of about 6 degrees. As discussed in the ALSJ after 166:45:15, the bearing and range puts them well inside the rim, about 250 meters north of their actuall location. This unusualy-large difference may be due to wheel slippage during the climb up North Ray Ridge. They follow they outbound tracks downhill toward Station 13. Duke: We can't see old (LM) Orion from here. (Laughing) This is going to be something going down this hill ... Look at that slope! Be sure that you got the brakes on. Tony, this is at least a 15-degree slope we're going down, and that Rover came right up it and you never even knew it. (Pause) Brake that beauty, John. (Laughs) Man, are we accelerating. Super. 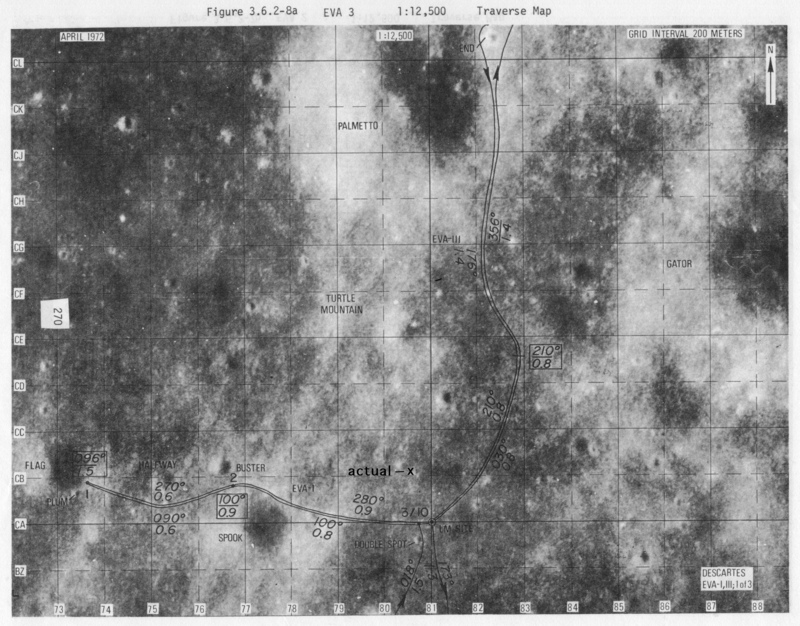 Young: (To Tony) We've just set a new world's speed record, Houston; 17 kilometers an hour on the Moon. At 168:14:31, they reach the top of the 1st rise. They've done 0.6 km in 4:45, giving a speed of 7.6 km/hr. On arrival at Station 13, the location error has reduced to 180 meters, perhaps because of John's use of the LRv brakes coming downhill. The segment from Station 13 to Station 10' covered sn odometer distance of 3.8 km, done in 28:53, at an average speed of 7.9 km/hr.